To stay comfortable in the rain, you’ll need a cycling rain jacket that comes with these 3 properties. With today’s technology, you can definitely find a rain jacket that looks great while meeting all 3 properties I mentioned above. If you’re riding in cold weather, a winter cycling jacket would do a much better job in keeping you warm. The Endura Pro Adrenaline Race Cape is made from Endura’s proprietary Exoshell fabric. It’s highly breathable, with a rating of 20,000g/m2/24 hours, which is above the average of 15,000g/m2/24 hours found in most cycling rain jackets. It has a snug racing cut so it’s aerodynamic without all the flapping. The translucent fabric allows for your race number to be visible through the shell, and it comes in black, white, and a high-visibility vibrant green. It also has reflective elements along the cuffs and hems for maximum visibility. The hems are made with a microfiber hem gripper so it fits snugly and securely. For those weight weenies, the Endura Pro Adrenaline Race Cape is extremely lightweight and packs down into its own pouch, so it’s also easy to keep in a pocket. The elastic cuffs fit snugly while still allowing room for your hand to push through. It has a slightly longer tail for protection and a padded collar and storm flap for comfort. More importantly, Endura Pro Adrenaline Race Cape designed to stretch in all the right places so you can cycle with ease. The Sportful Hotpack NoRain Jacket is lightweight, waterproof and weighs only 140g for a Large size. You can easily pack it down into its own small pouch that fits easily into your back pocket. Its sleek fit keeps it from flapping in the wind and slowing you down. The outer layers are made from superleggera DWR fabrics that repel water easily. Also, it’s also windproof to keep you safe from the elements. There are mesh inserts on the sides and back panels to make it breathable but without compromising its waterproofing capabilities. The seams are reinforced to keep out water and it has elastic around the wrists for a tight fit along with a thumb loop. The fabric is designed to be wrinkle free and it has a longer tail in the back to keep you dry. There are extra stretch in the areas where you need it, a waterproof zipper in the front, and reflective elements for safety. For women cyclists, it’s also available in women’s specific variant. This Altura Pocket Rocket 2 Jacket is made with Altura’s ErgoFit technology, making it cut for maximum comfort while you’re riding in the rain. 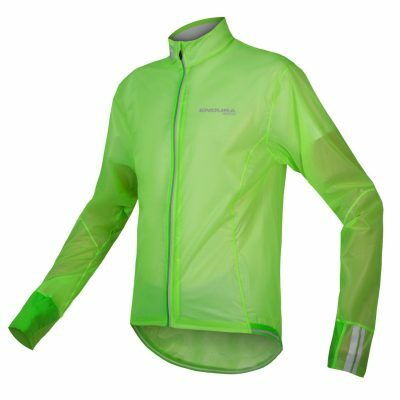 The outer layer is also highly reflective, which is an important consideration when you’re riding in poor weather conditions or dark areas. The fabric is waterproof, windproof, and breathable. Seams are well-taped so there’s no place for water to leak in, keeping you dry on the wettest days. 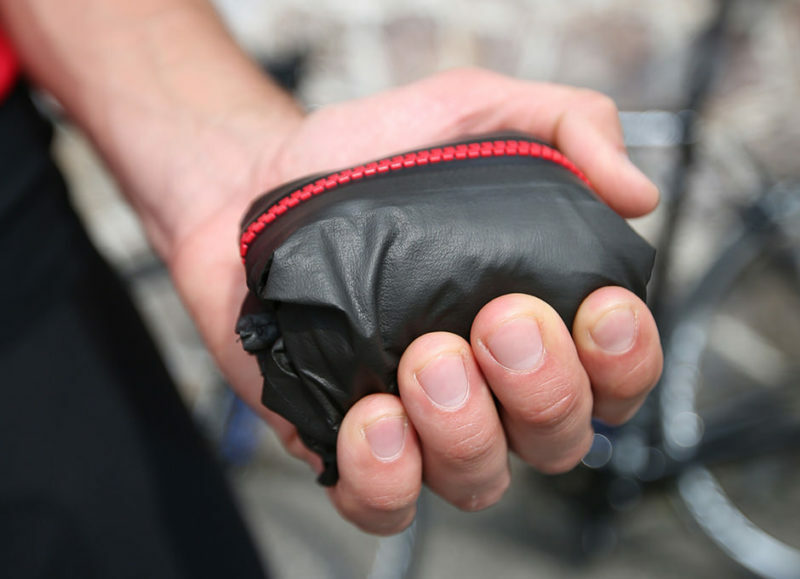 Size wise, it packs down into a zippered pocket so you can keep it on hand for emergencies and it weighs around 180g. It’s semi-fitted, so it’s suitable for racing or casual cycling. It comes in a variety of fun colors and has a slightly longer tail for your comfort and protection. There’s also a small zippered pocket in the back so you can keep important items with you when you’re on the go. Castelli is a well-known name when it comes to race wear. 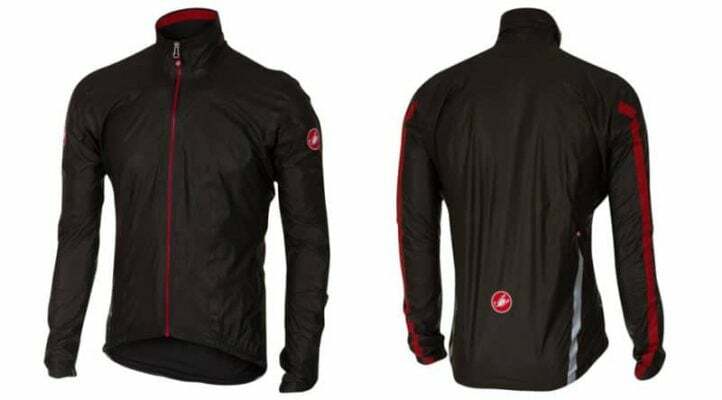 The Castelli Idro Jacket is a two-layer waterproof cycling jacket that’s lightweight and durable. Made from Gore-Tex’s latest Shakedry fabric, it’s backed by their “Guaranteed to Keep You Dry” promise. Shakedry is both waterproof and windproof, so you’ll stay just warm enough. It’s also breathable, so you’ll stay dry no matter how hard you cycle. A large-sized jacket weighs just 107g and folds down to fit easily into your jersey’s back pocket. The semi-fitted jacket fits nicely over your jersey and includes exterior zippers so you can access your jersey. It also includes a long tail and high neck to help keep you dry in the wettest weather. The seams are taped to prevent water from leaking through. 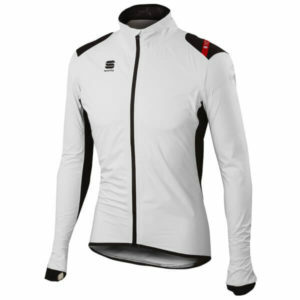 The Castelli Idro Jacket has reflective strips at the back panels for safety purposes. It includes a waterproof zipper and anatomic wrist closure. More importantly, there is a women specific variant of this rain jacket. The GoreTex Active Shell Jacket is a comfortable and stylish that will definitely keep you dry in the rain. It’s highly breathable while still being windproof and waterproof. This lightweight jacket is designed with a looser fit so it’s suitable for those who prefers layering. The hem is adjustable with a cordstopper and drawstring, giving you the ability to customize the fit even further. The cuff is also adjustable and the piping on the jacket is reflective so you’re easily seen. The GoreTex Active Shell Jacket runs long in the back to keep you protected from splashing. There is a zippered stow pocket in the back so you can carry needed items with you. The hood also stashes away in the collar. 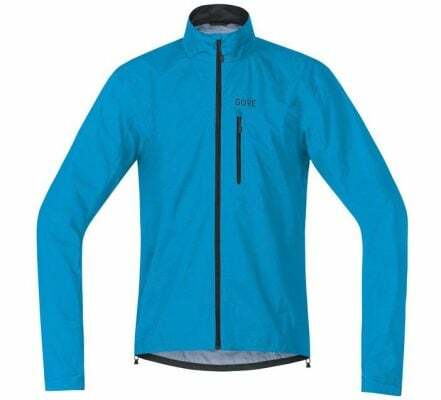 For those who are fashion minded, the GoreTex Active Shell Jacket comes in a variety of bright colors, in black, blue, red and yellow options. Care wise, it’s easy. Just wash it on cold and tumble dry on low. You can even iron it on a low setting. The most important consideration when you’re deciding on a waterproof cycling jacket is the type of fabric. Waterproof jackets are either made from laminate fabrics or they’re treated with Durable Water Repellant, or DWR. These are multi-layered. The inner layer is porous to release moisture from sweating, but the pores are too small to allow water droplets from rain to come through. The outer layer typically has a DWR treatment. DWR treatments force water to retain its surface tension, so the water beads and slides off instead of soaking through the fabric. The fabric stays breathable because the treatment doesn’t fill gaps in the fabric; it makes the fabric fibers bond. Not all waterproof jackets are created equal and they all perform differently. Manufacturers (not all of them) express the waterproofing capabilities in terms of mm. Let’s imagine you put a square 1″ x 1″ tube over a piece of waterproof fabric, you’ll need to fill the tube up to 10,000mm (10 meters) in height before water starts leaking through. The higher the number, the better the waterproofing capabilities. 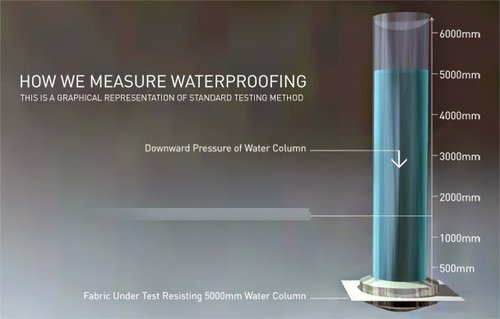 According to industry standards, here are the waterproof ratings explained. Less than 10,000mm. Minimal protection for activities like running and hiking in intermittent light rain and snow. 10,000 – 15,000mm. Medium protection for activities like hiking and skiing in moderate rain, snow and wind. 15,000 – 20,000mm. Excellent protection for most activities in moderate rain, snow and wind, with intermittent heavy rain and snow. More than 20,000mm. Extreme protection for persistent heavy rain, heavy snow, high winds and very wet environments. Ideal for activities like mountaineering, ice climbing, backcountry skiing and kayaking. No one wants to be covered in sweat while they cycle. Waterproof jackets may have an inner wicking layer as well as vents to help keep you dry. Jackets typically come in 2.5 to 3 layers and may have additional ventilation in areas where you’re most likely to sweat, such as under the arms. Some manufacturers (again, not all) do provide breathability ratings. It’s a number expressed in terms of how many grams of water vapor that can pass through a square meter of fabric in 24 hours. The type of fit you need depends on the type of cycling you do. If you’re looking for speed, you’ll want a more aerodynamic jacket with a slimmer and snug fit. If you’re spending long days on the road, you might want something with a looser fit so you can wear layers underneath. Some jackets also include details like a longer tail and thumb loops, which are great extra features to have. If you ride in unpredictable weather conditions, or if you’re expecting changeable weather during the ride, you may want a jacket that can be easily packed up and fit into the back pockets. Some jackets can be folded down to be quite small and have their own little pouch, while others are bulkier and might not be as easy to store when the weather changes. 1. How waterproof should my cycling rain jacket be? 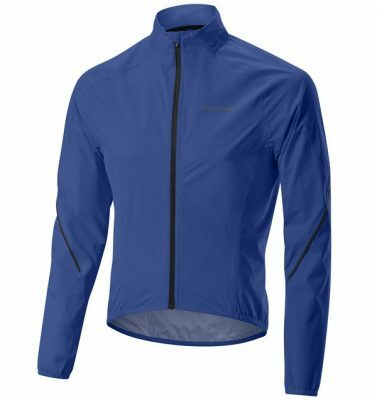 I’d recommend looking for waterproof cycling jackets that are rated between 10,000 to 20,000mm. With these, you’re looking at medium to excellent protection from heavy downpour when you’re out riding. Having said that, it’s also important to have excellent seam taping on the jackets to ensure water doesn’t seep through the tiny holes made by needles during the sewing process. Otherwise, the highest waterproof rated cycling jacket wouldn’t be able to keep you dry. 2. 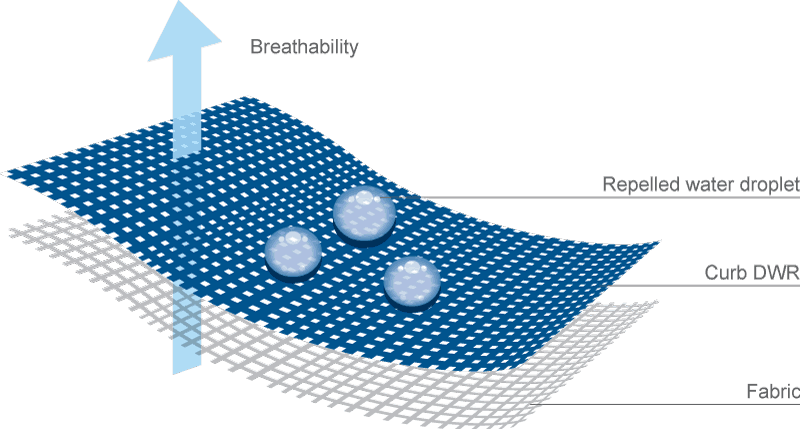 How breathable should my cycling jacket be? A layer of warm, moist air sits between the jacket’s inner layers and your under layers. A very breathable cycling jacket is not ideal especially in cold weather as it could the warm air to leave your body, leading to heat loss causing you to feel cold. At the same time, the jacket should also retain some of these warm air to keep you warm from the inside. Hence, there is a very fine balance between breathability and keeping warm. Too much of either is not ideal. You’ll want to look for a waterproof cycling jacket rated around 10,000 to 15,000g/m2/24 hours for cycling. The larger the number, the more breathable the fabric is. 3. How can the rain jacket both waterproof and breathable at the same time? A typical waterproof cycling jacket is made up of 3 layers. The outer layer, called the Face Fabric is to protect the inner layers and provide the stylish looks. It’s not waterproof but is treated with a DWR (Durable Water Repellent) solution so that it doesn’t hold up water on the surface. The middle layer, called the membrane. It’s job is to keep the water out completely. 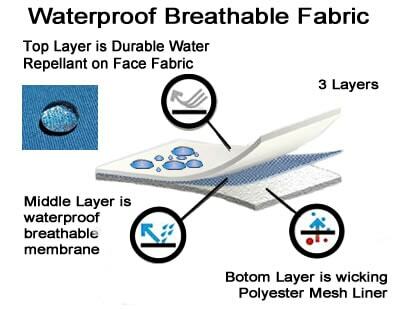 What’s unique about this layer is that it has holes that are too tiny to let water in, while at the same time having holes that are large enough for water vapor to escape, keeping you dry from the inside. Lastly, the innermost layer, the mesh liner is there to provide comfort while also provide sweat wicking capabilities. 4. What is DWR and how does it work? DWR stands for Durable Water Repellent. It’s a chemical treatment used on most outdoor clothing to make them waterproof. With DWR treatment, it causes water bead up and roll off the fabric which would otherwise add weight causing discomfort. Take note that the DWR treatment from the factory can wear off overtime due to the exposure to outdoor elements, oil and dirt. This causes the cycling rain jacket to be no longer waterproof. However, this can be easily treated at home by yourself to reactivate the DWR properties. You can buy aftermarket DWR sprays like Grangers and Nikwax and spray them on the jacket after washing. Alternatively, you can tumble dry them in a warm, gentle cycle after washing. GoreTex is a type of waterproof and breathable fabric found in outdoor activity clothing invented by Gore. It’s invented in 1969 and a registered trademark of W.L. Gore and Associates. 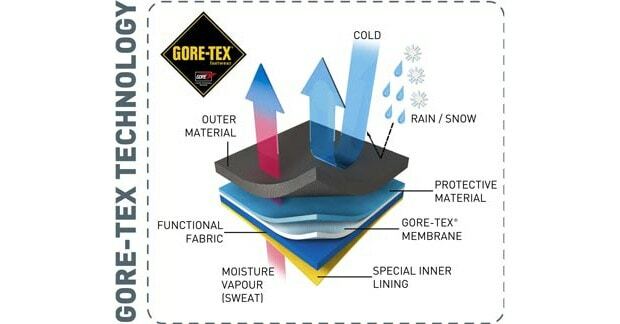 Gore-Tex fabrics have the capabilities to repel water drops while allowing water vapor to exit. Since its inception, there are now various variations of GoreTex such as GORE-TEX® Pro, GORE-TEX® Active and just the standard GORE-TEX®. You’ll notice that most premium waterproof cycling jackets comes with Gore-Tex fabrics, while low to mid-range jackets usually use the manufacturer’s own proprietary waterproof fabrics.